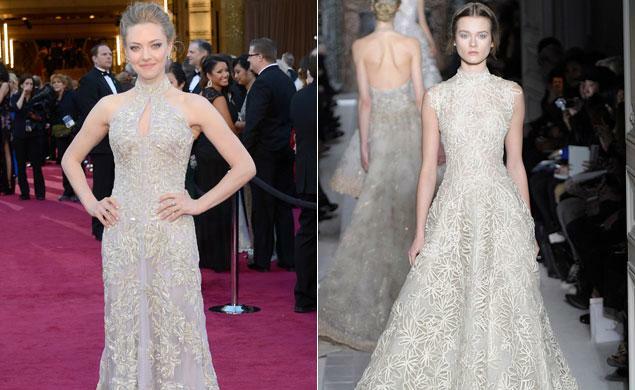 Anne Hathaway “threw a fit” when she saw a photo of the dress Amanda Seyfried would be wearing to this year Oscars. Anne Hathaway, who won the Academy Award for Best Supporting Actress, had planned to wear a gown by her good friend Valentino, but changed her mind after Amanda Seyfried shared an iPhone snap of her own Alexander McQueen creation – which was very similar – during a rehearsal. “Anne was like, <<WTF?>>” a source told Us Weekly. The scene left Amanda Seyfried, 27, “ruffled”, the source continued. “Amanda didn’t want to deal with it and left,” they said. To her credit, Anne Hathaway, 30, did not try to persuade her fellow actress to change her dress, they added, instead taking it upon herself to address the situation. The decision backfired on her though, with her stylists and beauty teams objecting to the wait as she agonized with stylist Rachel Zoe over the selection of a new gown, a second source told Us Weekly. “Anne made the fashion, make-up, hair, and jewelry teams wait at her home for hours as she decided what to do about the dress debacle,” they said. After trading her planned Valentino gown for a pale pink Prada creation, Anne Hathaway was forced to issue a public statement by way of apology to Valentino, whose press team had already sent out a press release announcing her choice, unaware of the last-minute switch. Anne Hathaway insisted that the trade was not intended as a snub to Valentino, who designed the wedding gown she wore to marry husband Adam Shulman last September. “Though I love the dress I did wear, it was a difficult last minute decision as I had so looked forward to wearing Valentino in honor of the deep and meaningful relationship I have enjoyed with the house and with Valentino himself,” the actress continued. Anne Hathaway first made reference to the gown switch when interviewed by Ryan Seacrest on the red carpet on Sunday. “I didn’t know what I was wearing until about three hours ago,” she told him. Her dress choice undoubtedly came as a surprise to Valentino, whose fashion house sent out a press release just before the awards show stating that it would be dressing Anne Hathaway, Sally Field and Jennifer Aniston. Anne Hathaway certainly caused a stir in her backless pink satin Prada gown – complete with a very perky bust line – which she accessorized with a sparkling Tiffany necklace. Anne Hathaway has worn a number of Valentino creations to awards ceremonies – including the bold red strapless number she wore to host the Oscars in 2011.